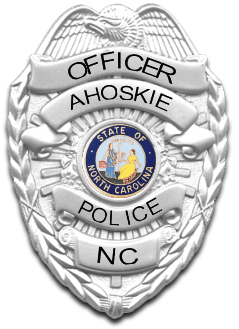 The Ahoskie Police Department is currently accepting applications for the position of Patrol Officer. Please go to the bottom of this page for the application forms you will need to apply. When an applicant has a criminal record, he/she must list ALL charges, regardless of the disposition or the date of the charge, on the Personal History Statement and the Report of Appointment / Application for Certification. Even if the court or the district attorney dismissed a charge, it still must be listed under the Criminal Offense Record section of these forms. Every charge listed must be accompanied by true/certified copies of the warrant for arrest, citation/magistrate’s order, etc. and the court disposition/judgment. This documentation may be obtained from the Clerk of Court’s Office in the county in which the applicant was criminally charged. Failure to list ALL charges may result in denial of certification, or suspension/revocation of an existing certification. A law enforcement officer with general certification may transfer from one law enforcement agency in North Carolina to another law enforcement agency in the state, provided he or she has less than a 12-month break in service. An officer holding probationary certification may not laterally transfer from one law enforcement agency to another. The probationary period must be completed in its entirety at the same agency. If an officer terminates employment with one agency before his or her year is up, then he or she must start a new probationary period at the new agency. Prior to employment as a certified law enforcement officer in North Carolina, out-of-state transferees must successfully complete the employing agency’s in-service firearms training and qualification program. They must also complete the Legal Unit (minimum of 98 hours) of the Commission-certified Basic Law Enforcement Training (BLET) Course and successfully pass the BLET state examination within their 12-month probationary period. Persons who have completed training as a federal law enforcement officer or a military police officer will be required to complete BLET in its entirety and successfully pass the BLET state examination prior to employment. A topical breakdown/syllabus of the courses that you completed in BLET. When an employing agency documents that an applicant has successfully completed a Commission-certified Basic Law Enforcement Training (BLET) course and meets the minimum employment standards, the Criminal Justice Standards Division issues Probationary Certification, which is valid for one year. Qualify with department issued Glock 21, 45 ACP. Complete a minimum of eight weeks in the Field Training Officer Program. This program requires new officers to conduct regular duties under the direct supervision and guidance of a Field Training Officer, conducted over all shifts. Successful completion of Division of Criminal Information terminal operator certification. Successful completion of moving/stationary radar certification. Successful completion of Chemical Analysis certification. Successful completion of a probationary period of one year. *New officers with previous law enforcement experience may have a reduced training regimen. Vacation: 48 – 144 Hours Per Year. Paid Health Insurance For Employee. Spouse And Family Plans Available. Sick Leave: 8 Hours A Month. North Carolina Law Enforcement Retirement System. Five percent pay increase after six months of service. Merit and Cost of Living increases each anniversary date thereafter. First… Check the ticker at the top of this page to ensure we are currently accepting applications. If so, download the below forms and fill each of them out completely. Pay special attention to the first document in the list. There are additional items detailed in this document that must be included with your initial application package. You can mail your application package to the Ahoskie Police Department to the attention of Major Jimmy Asbell. If you would like to email your employment package, you are welcome to do so. Once you have completed all of the required documents, they will each need to be printed and scanned. Don’t forget to hand sign and notarize all documents that call for it. When everything has been converted to an electronic document, email your completed application package to jasbell@ahoskiepd.com.